This is a difficult book to criticise, because as far as I am aware, it is the first attempt to survey Scottish angling literature. This aside, it is an amazingly forthright book with an engagingly odd layout. The work is in two parts. The first is a seventy-eight page semi-biographical romp through the personalities of the period (mainly nineteenth century fly fishers,) the second is a selection of writing by the great and not-so-great. Disappointingly, the biographies are rather slimmer than one would hope, and Simmonds has made some rather odd choices. Why give Scrope, a Wiltshire man, an entire chapter to himself, when Younger, a Scot who seems to have lived by the Tweed all his life, only gets three paragraphs? 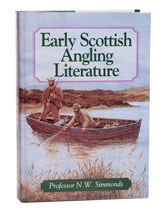 Early Scottish Angling Literature is a good introduction to the Scottish school; an important book because it accumulates all the known biographical details and anecdotes in one place for the first time. Perhaps in an attempt to preserve readability, the scope is rather shallow, and there is little here for the serious student. In addition, the occasional casual treatment of the facts slightly undermines the credibility of the work. For example, Simmonds dismisses the idea that Irish rods sometimes had the ferrules fitted 'upside down,' as an 'Irish joke,' when there is good evidence that rods actually were built this way, unlikely though it may seem. Despite these few caveats, I have no doubt that this will become the standard work, although it has now gone out of print. Someone ought to rescue it and encourage the Prof to do a new edition.